Details of our commitment to Chinese new year in Liverpools China town. 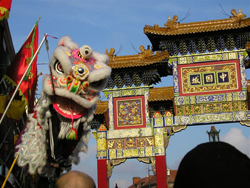 Since forming in 1970 the Liverpool Hung Gar Kung Fu club has performed a Lion Dance display in Liverpool's chinatown every Chinese new year. Each New Year we perform the display on the Sunday closest to the actual day. We start around 11 - 11:30 am and perform around Chinatown with a display with the Lord Mayor at 1pm at the bottom of Nelson Street in the local park. Please check the shows section of the site for other events we will be performing all year round.